How can you avoid the “crap your pants” copyright infringement letter? In this episode, we find this out and more with Richard Chapo, ESQ, Founder of SoCalInternetLawyer.com. He shares with us the types of entrepreneurs the inspire him. He goes on to explain why its important for entrepreneurs that create content to comply with the Digital Millennium Copyright Act or DCMA. Richard also shares his time working in the adult film industry. He goes on talking about working with Pat Flynn, his appetite for traveling, and trying not to get attack by mountain lions when he goes for a walk. He even shares his take on the recent controversy surrounding Fortnite. After the break, Richard shares with us steps you should take when starting an online business. He later talks about how when he first started out he wanted to be a traditional lawyer but later opted to take a different direction. Lastly, he shares with us why his superpower is staying focused. Richard Chapo, located in San Diego, CA is an Internet business lawyer who has been practicing law since 1992 and specializes in helping online entrepreneurs avoid “Crap Your Pants” copyright infringement letters and other threats when operating online. He’s traveled extensively around the world, having lived in Siberia in Russia for a year as well as spent time in much of Europe, Central America, and Asia. He enjoys working on internet legal issues for small business owners because the web is clearly the dominant force in our lives and most entrepreneurs have no idea that you can’t do things like the post someone else’s photo on your site or use someone else’s music in your YouTube video without permission. Richard also helps his clients learn how to operate their business online in light of the new trend of countries enacting laws that are dividing up the web. It’s not surprising that Richard would be knowledgeable about how different governments around the world are causing problems online considering how much time he spent wandering around Russia and Asia for a year. Richard is unique in that he’s totally aware that the law is a pretty boring subject. That’s why he tries to liven up subjects with humor and by providing specific examples of where well-known companies online have run into the problems he is discussing. Richard’s goal is to entertain your listeners instead of scaring them to death. Since the recording of this episode, Richard found the Fortnite case so fascinating that he created content to help explain the case. Check out the video here! Create content online? Let Richard help you to be DMCA compliant. Want exclusive content from The Startup Life Podcast? Sign up to be a patron on The Binge Podcast Network Patreon Page and Select The Startup Life All-Access Tier. Want gear from The Startup Life? Check out our gear! Are you being fearful or are you being selfish? What does it look like when being your true self leads to living your best life? Can you make money and empower people at the same time? In this episode, Gary Robinson of SCORE comes on to share all the resources and success stories that his organizations have. What is a Job To Be Done Practitioner? What is the formula for financial freedom? What would happen if you fully embraced millennials in your business? Are you in need of some Rapid Transformational Therapy? Can an executive coach propel you and your business? What does the path of entrepreneurship look like when you go through a merger? What does it mean to serve your customers truly? Why is customer service important for the entrepreneur to master? Are you in need of marketing help in your business? In the city of brotherly love, there is a company telling the story and many up and coming brands. Can a business coach get your business to the next level? Do people making purchasing decisions based on great advertising or is it much deeper than that? Can entrepreneurship be a tool stop recidivism? We think so! Is the way we pay for higher institution learning about to fundamentally change? One founder surly thinks so! What does it take to start a business in a dorm room and grow it to a multiple location success? On your path of entrepreneurship, do you really have to take that journey alone? What is the delayed gratification mindset? Are you staying on your spot? Are you pitch competition ready? How can a family member or friend help you win? Where has Dominic been? Is he still alive? Is starting your league out of reach? In this episode, we give you the tools to do just that. What does new leadership look like? In this episode, we sit down with JB Smiley as he lays out his vision for District 8. You've Bought The Block...Now What? Who Said Anything About Starting A Business? Our first episode introduces you to The Startup Life and what you can expect from the show. 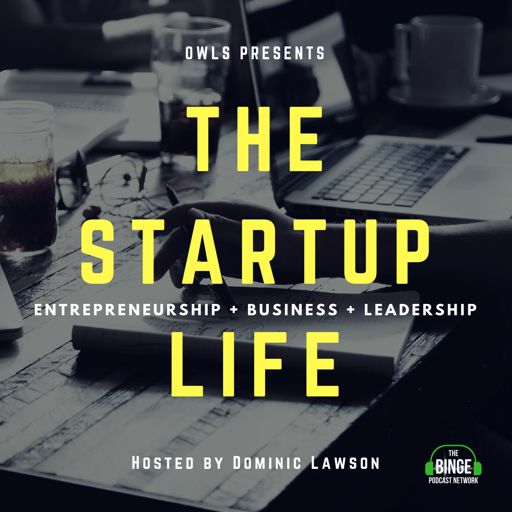 We discuss the story behind OWLS and why we love entrepreneurship.